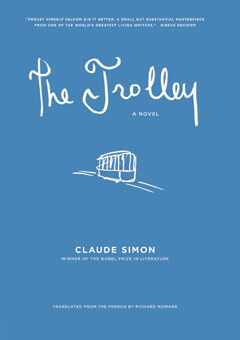 Claude Simon, a Nobel Prize–winning author and cultural icon in France, has written a Proustian novel, intermingling the memories of youth and old age. His madeleine is the trolley of the book’s title, the transport that took him to and from school every morning of his childhood. Passing back and forth between vine-covered hills, the trolley punctuates the trivial or cruel events of many lives, while action unfolds at the shore, in the gradually modernizing town, on a tennis court, and in a country villa. Elsewhere, life in all its fragility persists in the pavilions and labyrinthine corridors of a hospital, where our narrator now travels on a wheeled hospital bed, set to begin a new voyage into old age. When coincidences unite the two trajectories, the story becomes a fugue of memory that has delighted critics and made the book an immediate bestseller in France.